More than 50 businesses attended the city’s first conference on open innovation in March, where new products were demonstrated. About 60 years ago, the world’s first commercial product that included a transistor was built by Western Electric in downtown Haverhill. Today, Bounce Imaging, which Popular Science cited as having one of the best inventions of 2013, is relying on a company in the city’s Ward Hill neighborhood to create a high-tech orb that signals danger before first responders make their move. Lightspeed Manufacturing, a printed circuit developer with an international customer base, is working with Bounce Imaging to produce a working prototype of the device. The partnership began last fall, when Bounce entered a hardware start-up competition sponsored by Lightspeed. Bounce was recently named the grand prize winner of the Haverhill Hardware Horizons Challenge, a competition modeled after MassChallenge, an annual $1 million global competition that matches start-ups with mentors to help develop their products. The runner-up in Haverhill’s competition was Energy Harvesters, which is producing a device called the Walking Charger, which allows users to charge the batteries in their mobile electronics devices just by walking. The company has locations in Boston and Rochester, N.Y.
Third place went to Loci Controls of Somerville, which is developing a system to optimize the extraction of methane gas from landfills. Each of the three finalists received access to Lightspeed’s design services and production facility, workspace at the Burgess Business Center Incubator in downtown Haverhill, and access to mentors and materials. Bounce Imaging also received a $10,000 cash prize. “Our goal is to lower the barrier for hardware start-ups by providing contestants with a wide range of services and incentives to enhance their chance for success,” said John Michitson, who helped organize the Haverhill challenge. The Haverhill Police Department is expected to begin field tests of the baseball-sized Bounce Imaging Explorer in June, said Francisco Aguilar, 29, who cofounded the company with David Young, a classmate at the Massachusetts Institute of Technology. Police, firefighters, and military personnel are hoping it will provide surveillance in situations such as a terrorism threat, hostage crisis, combat zone, or natural disaster. The founders of Boston-based Bounce Imaging are determined to refine their product in Haverhill. The Haverhill competition has ignited interest in open innovation, a business concept developed at the University of California, Berkeley. It brings together research and development talent with entrepreneurial partners to share expertise and intellectual property with the goal of rapid co-development of products and services. 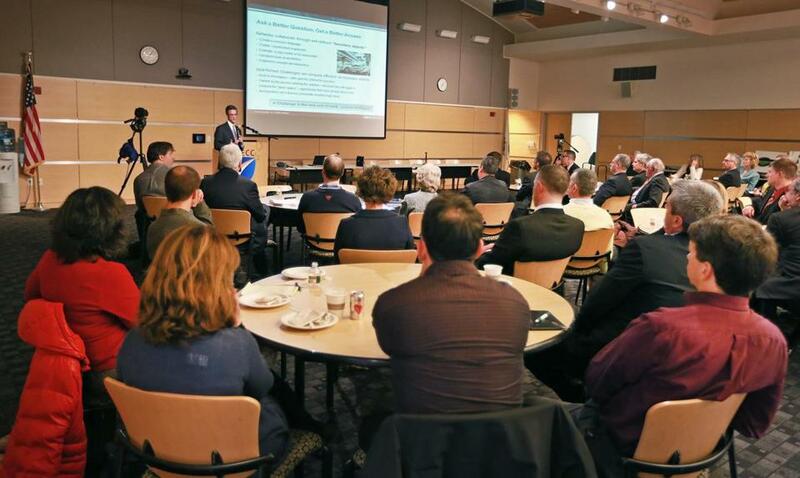 Northern Essex Community College, together with the Greater Haverhill Chamber of Commerce and the Haverhill Horizons Hardware Challenge, hosted the city’s first conference on open innovation March 20. More than 50 local business and educational leaders, community activists, and residents gathered at the college to learn how they could help to unite Merrimack Valley partners, such as start-ups and students, universities, investors, elected officials, and well-established companies. 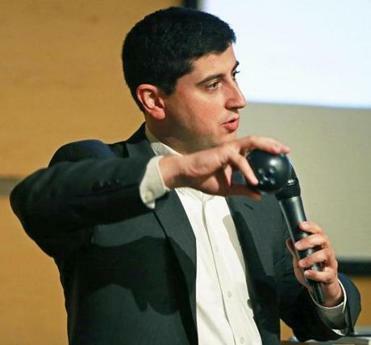 Francisco Aguilar, CEO of Bounce Imaging, addressed the city’s innovation conference in March. Bounce designed a device that would assess security risk to first responders. The mayor is championing changes to the city’s zoning bylaws in an effort to bolster innovation in Haverhill. “We want to enhance our local and regional competitiveness so that we can increase business and economic development in Haverhill and the Merrimack Valley,” Fiorentini said. Amirian said the business group hopes to play a key role in matchmaking for partnerships. Aguilar, the cofounder of Bounce Imaging, said the culture of support will enable entrepreneurs and businesses to thrive.